MainAll NewsMiddle EastIran Dispute 'Quickly and Easily' Resolved? Iran Dispute 'Quickly and Easily' Resolved? Tehran says the dispute over its controversial nuclear program can be quickly and easily resolved... if the West lifts sanctions. Iran said Monday it is ready to resolve all issues concerning its nuclear program "quickly and easily" in a second round of talks with the P5+1 slated for Baghdad on 23 May. Tehran's foreign minister Ali Akbar Salehi told the semiofficial ISNA news agency that Iran "might be more flexible" if it could be guaranteed an external supply of enriched uranium – an apparent endorsement of a US compromise proposal. Salehi's remarks come as US President Barak Obama and Prime Minister Binyamin Netanyahu traded fire over whether allowing Tehran to push the next round of talks off for almost five weeks was a "freebie" for Iran. Iran's halting its secretive uranium enrichment program – a key demand by Jerusalem and Washington to avoid military strikes on its nuclear facilities – was previously rejected by Iranian President Mahmoud Ahadinejad and his chief nuclear negotiator Saeed Jalili. 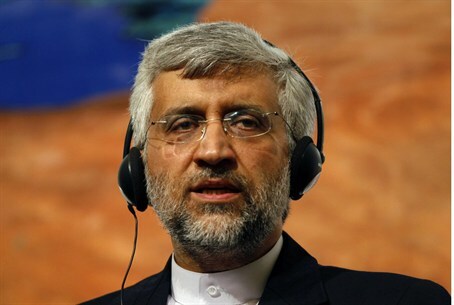 However, Mohammad Javad Larijani – a close advisor to Iran's supreme leader Ayatollah Ali Khamenei – has made numerous statements in recent months intended to back Iran away from the increasingly out-of-favor Ahmadinejad's strident nuclear stance. Last month, Larijani said the West should accept Iran's "peaceful nuclear program," sell Iran 20 percent enriched uranium, and provide the customary assistance nuclear nations provide to those building nuclear power plants. In return for cooperation from the West Iran would offer "full transparency," Larijani said. Meanwhile, Salehi also urged Western countries to engage in "trust-building" with the Islamic Republic by lifting crippling sanctions on its banking and oil industries. Salehi's statements appear to signal flexibility after Saturday talks in Istanbul with the P5+1 – the five permanent members of the UN Security Council plus Germany – over Iran's controversial nuclear activities. "We are ready to solve all issues very quick and easily, even in the Baghdad talks, if there is goodwill," Salehi said. "It is possible to discuss in the talks percentages of uranium enrichment," said Salehi. "If they guarantee supplying us with fuel of various enriched levels, the case will be different." Nonetheless, Tehran ignored another Western concern – Iran's existing stockpile. The West wants Iran's current stores of 20 percent-enriched uranium to be transferred out of the country. The International Atomic Energy Association has issued two reports in recent months indicating Iran has sought – and continues to seek – nuclear technology that has solely military applications. It has also raised pointed questions about Iran's push to enrich its uranium stockpiles to 20% purity, a key jumping-off point should Iran make a dash to enrich its uranium to the 93% needed for nuclear weapons. Iran says it is enriching uranium to 20% in order to research medical isotopes, but proliferation experts say Tehran is enriching far more uranium than is necessary for that purpose and does not have a sufficiently advanced medical research sector to support the claim.